The out-of-style sweater your Mother-in-Law gave you. The beef jerky you can't eat because you are a vegan. The music CD you will never listen to because you don't like country music. The sheet set you can't use on your bed because they won't fit. The gag gift coffee mug with the inappropriate words on it that your coworker gave you that you will never use. The list goes on. Each year, millions of unwanted gifts will be shoved in closets, donated to charity, or even thrown in the trash. Before disposing of unwanted Christmas gifts, try selling them on eBay. There is a perfect buyer for everything and just because an item doesn't work for you doesn't mean you can turn it into cash on eBay and re-home it with someone who wants that exact item. Before attempting to resell unwanted Christmas gifts, you must remember to be stealth about it. Stay under the radar. Don't broadcast at the office party, "Looks like this is going on eBay!" Don't even mention to anyone that you plan to resell it. It will be an embarrassing moment when your coworker Jim tells your other coworker Kevin that he heard you sold the gift on eBay. Reselling an unwanted Christmas gift on eBay is better than re-gifting. If you aren't familiar, the term re-gifting was coined by Jerry Seinfeld in the episode where Elaine gives Tim Whatley a label maker, then Tim gives it to Jerry as a gift and Elaine find out. Not great for friendships or even casual relationships. 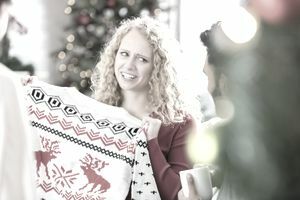 If you re-gift an unwanted item to someone you know, odds are that the person who gave you the gift may find out through your circle of friends. Avoid selling unwanted gifts on local Facebook Groups as well. Since these groups are local and you may have friends in common with someone who looks at your post, you want to avoid any embarrassment or humiliation of the giver finding out that you are trying to sell their gift. eBay is best since your buyer will probably be hundreds or thousands of miles away. Furthermore, an eBay account is more anonymous. Most eBay user IDs are cannot be traced back to the person who owns them, unless a purchase is made and the Paypal transaction is completed. If you receive an item you absolutely don't want or can't use, list it quickly and get in on the December sales frenzy! Lots of shoppers come to eBay in late December or early to mid-January to spend money and gift cards they received as gifts. Some people get their Christmas bonuses late in December so they will be ready to shop online even after Christmas. Furthermore, some families have a delayed Christmas celebration the week between Christmas and New Year's so they may not buy gifts until Christmas is over. Wouldn't you rather have cash for that item rather than shoving it in a closet or a drawer and finding it months from now? The weirder the better when it comes to eBay. People collect all sorts of unusual items, or they don't want to be like everybody else so they seek out items to showcase their uniqueness. It is all about self-expression. Think about Phoebe Buffay on friends and all of her kitchy, offbeat, and quirky clothing, home decor items, and jewelry. That type of person can be your eBay customer. Listing the item on eBay is half the battle. Make sure you use free eBay features and selling strategies to sell the item quickly. Here are a few ways to move your item faster so that you turn that unwanted gift into cash as quickly as possible. Use Best Offer. Best Offer is an effective way to start a conversation with buyers and allow them to make the first move to negotiate a sale. Some buyers won't even consider buying from a seller who doesn't allow offers. So make sure you have used Best Offer on all listings, and don't be offended by low offers. Everyone wants a deal, but you don't have to settle for less than the market price if you don't want to. Use fixed price 30-day listings, not auctions. Unfortunately, eBay auctions have gone the way of cassette tapes and rotary phones—they are obsolete in today's fast-paced world. Most buyers do not want to wait for an auction to end. They want to buy the item now, have it in the mail in a day or two, and receive it quickly. Auctions drag out the process and don't rank well in Google searches. Avoid them. Ship internationally. Only a fraction of eBay buyers live in the USA. When you limit sales to only the United States, you are excluding millions of buyers. International shipping isn't difficult or complicated. It just takes a few more steps. Remember, people living in other countries are just regular people like you who want to buy stuff online. There is no reason not to sell to them. eBay even offers it Global Shipping Program (GSP) and takes responsibility for items that are lost or damaged in transit. Before you toss those unwanted Christmas gifts, give eBay a try. You can end up with some extra cash in your pocket, and help someone else find an item that is perfect for them, but that you won't ever use.